What is an AC line set? 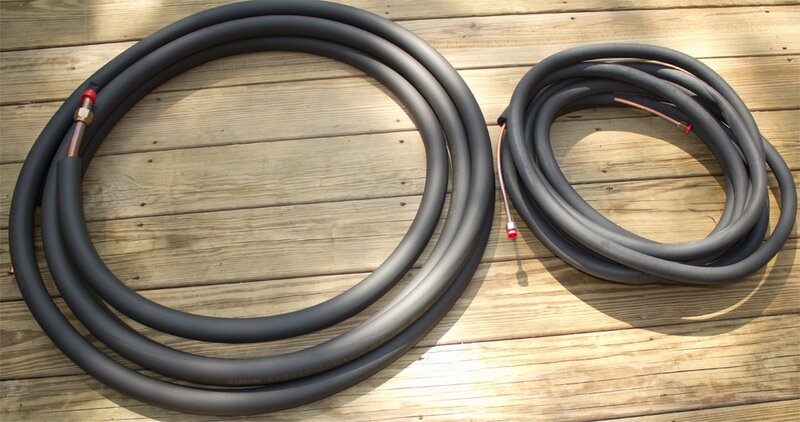 A line set consists of two semi-flexible copper pipes that connect the outdoor air conditioner or heat pump to the indoor air handler. It is these pipes’ job to transport refrigerant throughout your cooling system, and considering that proper circulation of refrigerant is the whole reason your cooling system, well, cools, a line set’s job is a pretty important one. Each line set includes one large pipe, called a suction line, and a smaller pipe, called the liquid line. The suction line transports refrigerant in its gaseous state, while the liquid line transports refrigerant in its liquid state. Both of these lines, when intended for mini-split HVAC units as opposed to traditional central air systems, are insulated and feature flare connections at each end to ensure a tight, pressure-resistant seal. Why is it important to choose the right line set? All HVAC copper line sets perform the same function, but for your line set to function as it should, you need to make sure you’ve chosen the right size. Pipes that are too large for your system will result in less pressure within the tubes, causing the slow-moving refrigerant to change states at the wrong time and not function at all. Pipes that are too small for your system will result in excess pressure within the tubes, causing the system to internally flood. It goes without saying that you don’t want either of these things to happen. Line sets cannot be adjusted or resized in width, so choosing the right size AC line set at the time of purchase is crucial if you want your mini-split HVAC system to function properly. This 100% copper line set uses a flare connection to attach to the indoor unit. The size of a line set is determined by width (uninsulated) and length. Both of these factors are important to consider in determining exactly what size you need for your ductless mini-split system. Some specialty systems may feature slightly different sizes, but these are the options you can generally expect to find when shopping for a line set. Line set listings will also feature a third number, which is the insulation thickness on both the suction and liquid lines. 1/2” insulation is recommended for all systems using R410A refrigerant (which, by now, is the vast majority of all units, AC or otherwise, that require refrigerant). All mini-split line sets offered on our website feature 1/2” insulation. The surest way to determine which size line set you need is to check with the manufacturer of your unit; they will always know exactly what size each individual AC unit requires. For all ductless mini-split air conditioners for sale at Total Home Supply, we include a list of appropriately sized line set options in the main product listing, so there is never any doubt as to whether you are choosing the correct one. The reason line set size is unit-specific is because certain systems require more/less refrigerant than others, thus requiring larger/smaller lines. Generally, larger units require larger lines and smaller units, smaller lines, but the system’s engineering and efficiency is important to consider as well — a mini-split air conditioner with high BTU and SEER ratings will require a smaller line than a less-efficient unit, because high-efficiency ACs use less energy and thus require less refrigerant to operate. Once you have determined the required width of your line set, you’ll need to figure out how long your lines need to be. The required length of a line set is unique to each individual installation and simply depends on how far apart the indoor and outdoor units are from one another. Line sets are usually offered in 15’, 25’ and 50’ lengths, but some systems can support lines up to 150′, so there should be no problem finding a length suitable to your own needs. Lines can be cut to fit specific installation requirements, so when in doubt, always choose a longer line set than you think you will need. It is also important to note that line sets should be made of copper, and only copper. Aluminum line sets are a cheaper option, and you will find copper-aluminum (Co-AL) hybrid line sets for sale through some retailers, but we do not recommend them for use. Aluminum is less flexible and less resilient than copper, and so aluminum line sets are more difficult to install and could be prone to leakage. Aluminum line sets are also not suited for R410A refrigerant, which, as we’ve mentioned before, is the standard for all cooling products manufactured in recent years. When shopping for a line set, regardless of which size you need, choose all-copper pipes. Installing a ductless mini-split HVAC system is an extremely complicated endeavor, and setting up the refrigerant is arguably the most difficult part. For that reason, we do not recommend you try to install line sets yourself. Installing a mini-split system requires extensive electrical knowledge, so for your own personal safety, as well as the safety of the unit, we strongly suggest you hire a professional who will be able to do the job correctly. If you have any other questions regarding line sets or other ductless mini-split parts & accessories, please do not hesitate to contact us at 1-877-847-0050 to speak with our qualified sales representatives. In the market for a new ductless mini split? Check out our free Multi Zone Mini Splits Buying Guide! Manufacturer sent larger line sets for recessed mini splits than required and the house is finished. Alot of sheetrock has to be removed to replace lines. Can I reduce part of the lines to keep from removing sheetrock,paint,insulation etc. Reducing the fittings will not solve the problem. The system will not function correctly without the properly sized lines. You can use it since it is the same size. I would recommend having your contractor clean the line. As always, make sure to pressure test the line prior to charging the system. I have an 18000 btu mini split ac, my problem is the suction line is not the same as the original 1/2 size..we already fixed a 5/8 suction line and 1/4 discharge line. My question is, is there any changes or problem in cooling? Your system will not work correctly if you do not use the correctly sized lines. If you try to use larger or smaller lines, the unit will not get the correct amount of refrigerant. A little less efficient on mine. Same exact problem wrong line set from manufacturer. Can I Hook up 5 head units to one outside unit ? It depends on the specs of your system. For example, the LG LMU18CHV can go a maximum distance of 82 feet per zone. Other systems will be less. It depends on your specific model, but most Panasonic 18,000 BTU systems require 1/4 and 1/2 inch line sets. are all outdoor units male flare end the same size? No, the sizes are different depending on the system. I have a 1.5 ton cooling only mini split with 3/8 liquid line and1/2 suction line. The new inverter drive equipment is 1/4 liquid line and 1/2 suction. It would be very difficult to replace the piping. I know that the system is metered refrigerant feed from outdoor unit to the indoor. The outdoor unit is 20 feet above the indoor. Any comments? You would need to replace the line set. Using the wrong size will cause the system to malfunction and void the warranty. Are the measurements for these line sets measuring the Inner or outer diameter? Thanks. Refrigerant lines are measured by the outside diameter. My recessed mini splits condensate on trims after running about 30 minutes any suggestions on what to do?